Maker: Valentine Distilling, Ferndale, Michigan. Appearance: Dark copper with long thin legs. Nose: Alcohol, maple wood, leather. On the palate: Sweet but not cloying. Maple syrup (the real stuff), caramel, wood, alcohol. Finish: Pleasant and drying. Touches of maple linger on as the wood (mostly maple) takes hold and then gently fades away. Parting words: I’ve been sitting on this review for a while now because of the video reviews but also because I had a lot of questions about Valentine’s operation. Since it’s only a few miles from Sipology Blog HQ, I decided to check the place out for myself before finishing my review. I’m glad I did. It is distilled and aged in Ferndale in a small building that also serves as tasting room and a cocktail bar. They also make a vodka, an elderflower flavored vodka, Liberator Gin, and a barrel-aged version of Liberator Gin (review coming soon). We also had a sample of their bourbon (presumably with the same mashbill as Woodward Limited) which they sell right out of the barrel at barrel proof from behind the bar. It comes it at 114° and is quite good for its age. The bartender said they also sell it by the barrel which prompted several questions from my friend and me about distribution and the three tier system, none of which the bartender was capable of answering. So if you would like the try the bourbon, I would suggest stopping by the distillery yourself. 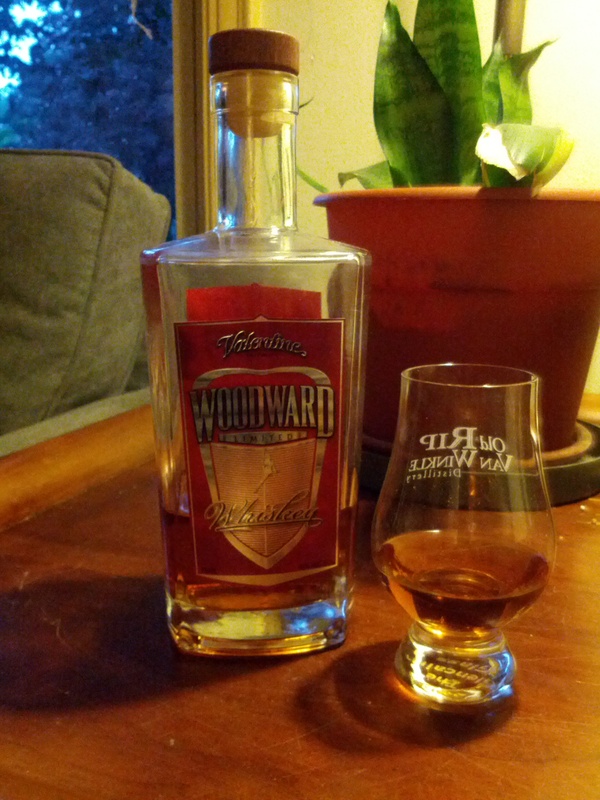 At any rate, Woodward Limited Whiskey (named after Woodward Avenue, the historic Michigan highway that runs from downtown Detroit through Ferndale and Royal Oak and on to Pontiac) is a winner. The maple flavoring (syrup according to our bartender) doesn’t overwhelm, but it balances out the youthful edges of the whiskey nicely creating a pleasant after supper sipping whiskey. Where it excels is in cocktails. It makes a very good Manhattan and fantastic Old Fashioneds and Boulevardiers. I’m sure it would work very well in other cocktails as well. As for the price, it’s reasonable for a microdistilled whiskey at just under $40. Woodward Limited Whiskey is recommended. B. Full bodied. Licorice, stone fruit. A. Hot and long lasting with a bit of candy behind the burn. B. Mellow and fruity. Grape soda, alcohol. Fades quickly. A. Excels in a Manhattan and does well in an old fashioned. Gets a little lost in cola. B. Adds an interesting fruitiness to the Manhattan, does the same in an old fashioned. Downright tasty in ginger ale. Both of these bourbons are examples of small producers selling bourbon sourced from MGPI, Indiana but putting their own stamp on it. Both are successful in creating something different and probably superior to what they started with. As for Beer Barrel Bourbon (B), the fruity aspects of the stout that previously occupied the barrel come through the most, although a little of the roasted malt character also comes through. It is a successful experiment but I don’t know if I’d buy another bottle. Mildly recommended. Spring Mill (A) has more of a classic bourbon flavor. Rebarreling the often lackluster MGPI bourbon has added needed depth and sophistication. One of the proprietors of Heartland was not forthcoming about the nature of the second barrel (char level, size) when I communicated with him on social media, but I suspect it is a slightly smaller barrel with a lighter char, maybe 2 or 3. Whatever the case, it worked very well. The ceramic bottle adds interest (although I’m not quite sure how to recycle it) and the fact that the bottle shares the name of a street on the North Side of Indianapolis near where I grew up is a sentimental bonus for me. Spring Mill is recommended. Looking forward to some of the new barrel strength version of this stuff soon! Appearance: copper with a pearl necklace of some significance, like on Antiques Roadshow. Nose: Wood and char, quality toasted wheat bread. vanilla. Some sweet marshmallow flavors as well. Finish: Moderately hot and distinctively drier than the standard Maker’s. Parting words: I first tasted this at the 2010 Spring Sampler in Bardstown. I liked it then and I like it now. the differences from the standard Maker’s are easy to pick up on. It has a very nice woodiness, but in a different way than old wheaters like the Pappy Van Winkles or Very Special Old Fitzgerald. It is more perfumed than tannic. I find it very pleasant. No Maker’s bourbon is going to be a life-changing experience, but 46 works well as an affordable dessert sipper.